Birding Is Fun! : BSBO Pelagic Trips: King Eider! Last weekend, I helped lead the first of three Lake Erie pelagic trips hosted by Black Swamp Bird Observatory (BSBO) out of Cleveland, Ohio. Normally, we set off in search of gulls and ducks, but this time we had a specific target! A King Eider had been reported on Friday, and it just so happened that it was only a couple miles from the dock where the boat left from. After boarding the boat and cruising down the river, we started chumming (throwing bread and popcorn out behind the boat) as soon as we got onto the lake. Chumming is a way of getting thousands of gulls to follow the boat around. 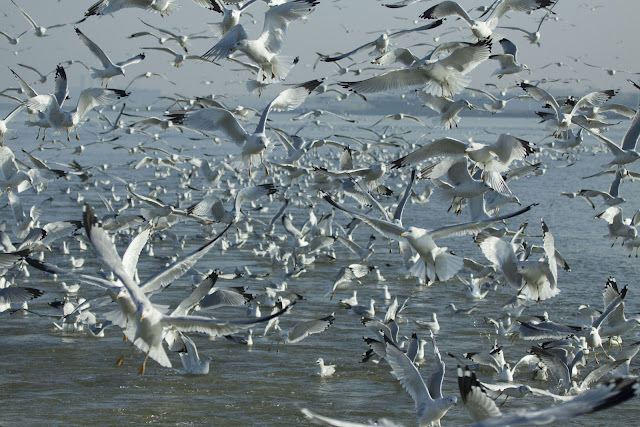 Mostly it attracted the common Ring-billed Gulls, but we always hope the large crowd will attract something more rare and exciting. 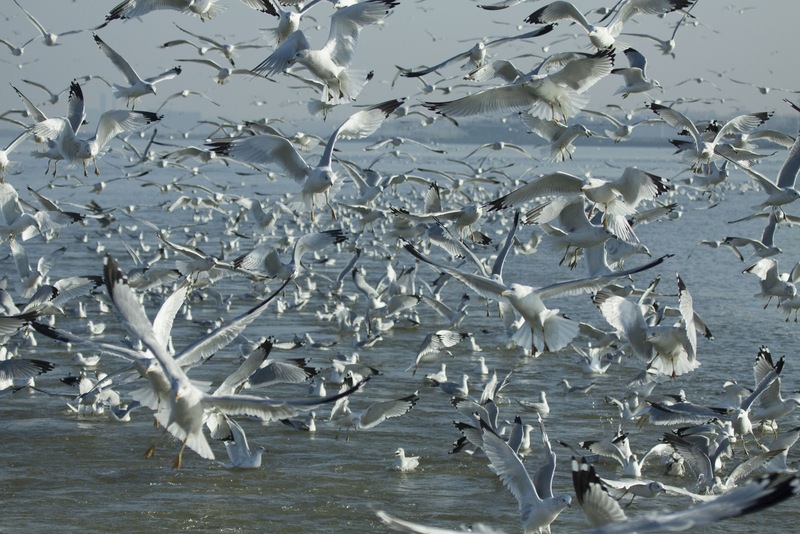 Our following of Ring-billed Gulls! As we continued to make our way towards the location where the eider had been reported, we found a group of three scoters - 1 Surf and 2 White-winged. The group took flight, and the Surf Scoter flew pretty close to the boat. We stopped briefly to look at a bird that we thought might have been the eider, but it turned into a Red-breasted Merganser as we got closer. 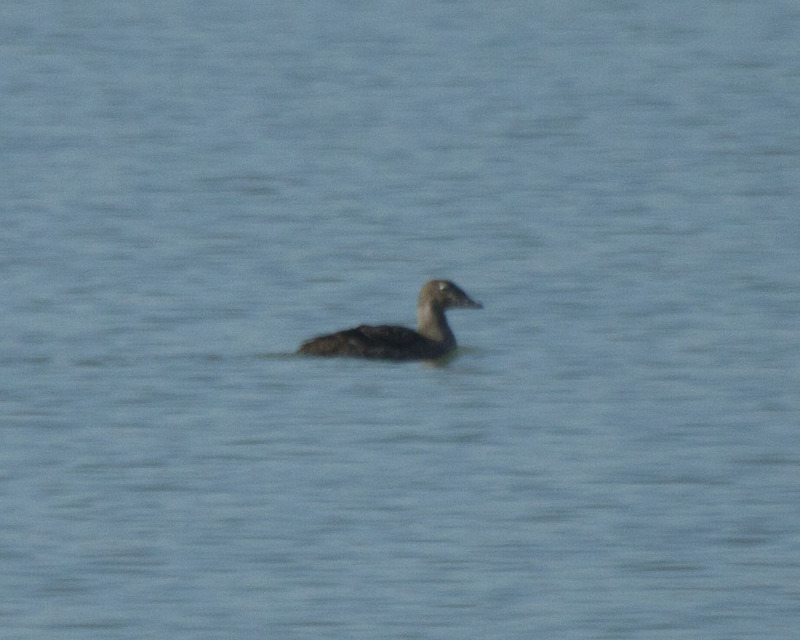 It only took a couple more minutes of searching before we found the King Eider! It was a lifer for me and many of the trip participants. A female King Eider on Lake Erie! After everyone got their fill of the eider, we cruised around the lake for the next 2.5 hours looking for new birds. Among the hundreds of Ring-billed Gulls following us, we were able to pick out some Herring and Bonaparte's Gulls. On the water, we found many Red-breasted Mergansers and Common Loons. 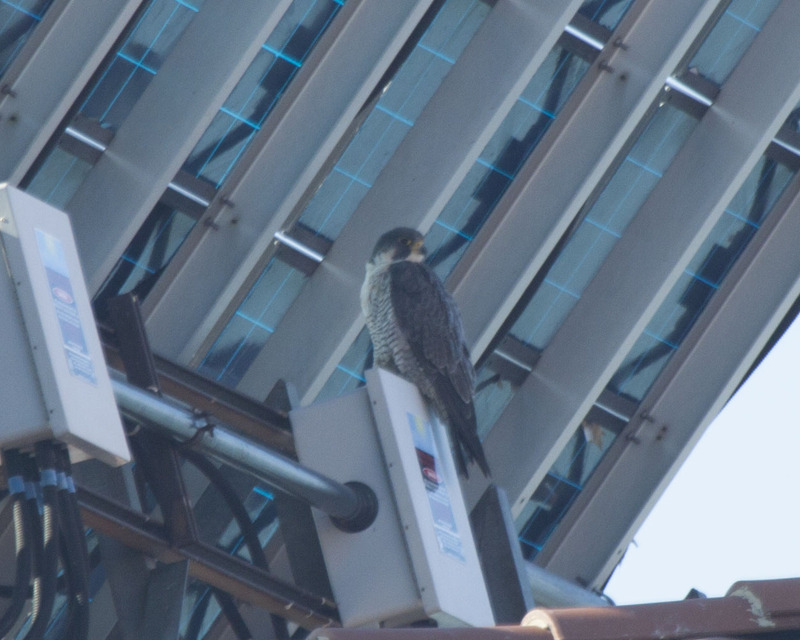 Out in an area known as "the Crib" we found a Peregrine Falcon. The Crib is the main water intake for the Cleveland water supply. It is a huge structure that sits about 3 miles out in the lake. A Peregrine Falcon perched on "the Crib"
One bird that was a little surprising was a Gadwall that was seen out over the lake. 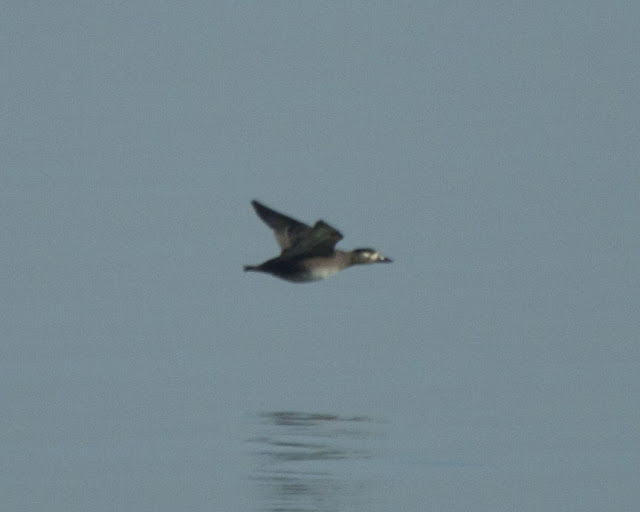 Just as we got back to the mouth of the river, someone spotted a Long-tailed Duck on the water. It quickly took flight, but most of the people on our trip saw it as it flew by. We had an awesome day out on the lake and could not have asked for better weather. The lake was extremely calm which made spotting birds easy! If you think this trip sounds like fun, be sure to join us for one or both of our next trips on November 24 and December 8. You can register for the trips here. Great job. The first photo is fantastic! Congrats on the King Eider! Nice shot! Sounds like you had a wonderful time. Congratulations on the life bird!